Bangladesh Petroleum Corporation (BPC) Job Circular 2018 has been published The Daily Azadi on 19/11/2018 and Bangladesh Petroleum Corporation (BPC) Official website http://www.bpc.gov.bd/. Bangladesh Petroleum Corporation (BPC) Total 14 posts are 39 vacancies are appoint. Every interested person can apply for this job within specific time. a. Please prepare a color Photograph (Dimension 300x300 pixel JPG format within 100KB) and Signature (Dimension 300x80 pixel JPG format within 60KB). e. You Should fill up all information correctly. f. Upload your photo and signature. i. Download your copy and print your Application copy for future reference. j. Complete the payment in Teletalk mobile within 72 hours. Candidates have to pay online application fees by Teletalk mobile phone. An application fee is Candidates have pay application charge by Teletalk SMS. After that applicant will get a reply sms, here will be found 8 digit pin code then candidates will send 2nd SMS. Reply: Applicant’s Name, Tk.112/- and 56/- will be charged as application fee. Your PIN is (8 digit number). Reply: Congratulations! Applicant’s Name, payment completed successfully forBangladesh Petroleum Corporation (BPC) User ID is (xxxxxxxx) and Password (xxxxxxxx). Bangladesh Petroleum Corporation (BPC) authority Mobile SMS declaration will be published Admit Card. Every applicant can download login with User Id and Password at http://bpc.teletalk.com.bd/. Bangladesh Petroleum Corporation (BPC) authority Mobile SMS declaration will be published Seat Plan and Exam Center at your Admit Card. You can download Admit Card login with User Id and Password at http://bpc.teletalk.com.bd/ and http://www.bpc.gov.bd/. Bangladesh Petroleum Corporation (BPC) authority will be published at their Official website notice board http://www.bpc.gov.bd/. 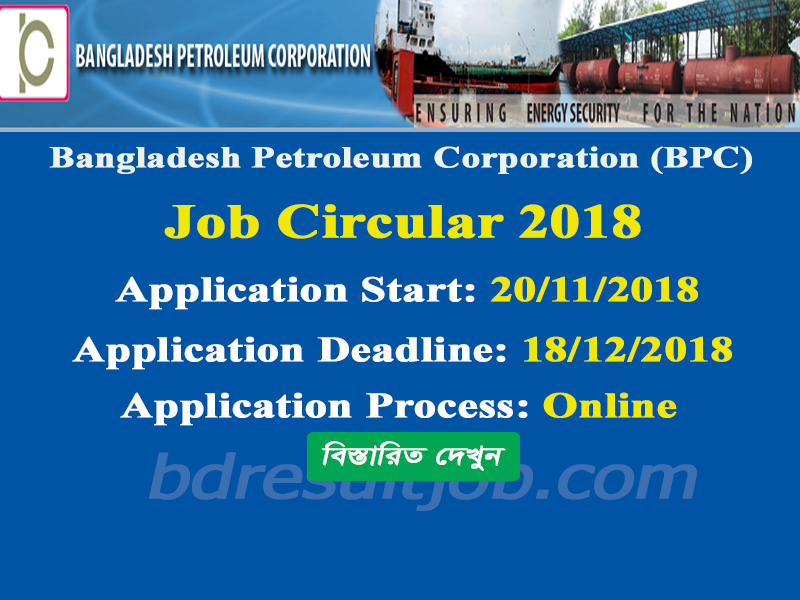 Tags: Bangladesh Petroleum Corporation (BPC) Job Circular 2018,www bpc gov bd, www.bpc.gov.bd, www.bpc.teletalk.com.bd, www bpc teletalk com bd, bd govt jobs, best job sites, job advertisement, job portal, jobs in bangladesh, latest job, job fair, new govt jobs, bdjobs career, bd job circular, bd govt jobs, latest govt jobs, job opportunities, bd jobs, job search, jobs, job, jobsite, government jobs, job vacancies, bd jobs, job search sites, job opportunities, all govt jobs, looking for a job, government jobs 2018, bd jobs government, new job circular bd, today govt job bd, newspaper job circular, latest govt jobs, govt circular bd, circular government jobs, new govt job circular in bangladesh, new job circular bd, looking for a job, new govt job circular in bangladesh, Bangladesh Petroleum Corporation (BPC) Recruitment Circular 2018, Bangladesh Petroleum Corporation (BPC) Recruitment Admit Card Download, Bangladesh Petroleum Corporation (BPC) online application form 2018, Bangladesh Petroleum Corporation (BPC) Exam Result 2018. 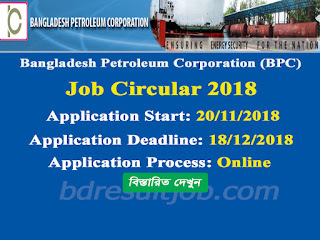 Bangladesh Petroleum Corporation (BPC) Job Circular 2018,www bpc gov bd, www.bpc.gov.bd, www.bpc.teletalk.com.bd, www bpc teletalk com bd, bd govt jobs, best job sites, job advertisement, job portal, jobs in bangladesh, latest job, job fair, new govt jobs, bdjobs career, bd job circular, bd govt jobs, latest govt jobs, job opportunities, bd jobs, job search, jobs, job, jobsite, government jobs, job vacancies, bd jobs, job search sites, job opportunities, all govt jobs, looking for a job, government jobs 2018, bd jobs government, new job circular bd, today govt job bd, newspaper job circular, latest govt jobs, govt circular bd, circular government jobs, new govt job circular in bangladesh, new job circular bd, looking for a job, new govt job circular in bangladesh, Bangladesh Petroleum Corporation (BPC) Recruitment Circular 2018, Bangladesh Petroleum Corporation (BPC) Recruitment Admit Card Download, Bangladesh Petroleum Corporation (BPC) online application form 2018, Bangladesh Petroleum Corporation (BPC) Exam Result 2018.